The more that you read, the more things you will know. The more that you learn, the more places you’ll go! We’ve been plotting this for months, and we’re so pleased to finally announce the details of Oh the Places You’ll Go!, a Little Free Library design competition we’re hosting on May 1st. Why are we doing this? Like most St. Louisans, we’ve been profoundly affected by Ferguson and its aftershocks throughout the greater St. Louis community. We wondered: Is there anything architects and designers can do to build bridges in St. Louis? We’ve always wanted to host a Little Free Library design competition, and, after having a few conversations with the people at the Little Free Library organization, we learned that police departments in Los Angeles, Seattle, and now Ferguson are starting to use Little Free Libraries to give police officers a way to interact with those they serve and protect, especially with children. We thought this could be a great way to distribute libraries from such an event to areas that need them most in St. Louis, while at the same time providing a way for officers to be seen in a different way in the neighborhood. In L.A. and Seattle, officers are the “stewards” of the libraries, and they hold literacy events/book clubs with the neighbors to start building relationships with the people in their communities. We pitched the idea to the St. Louis Metropolitan Police Department, and the officers are on board. The juvenile division is going to place the wee libraries from our event in areas that could use a renewed relationship between police and residents. When we say “competition,” we’re using this term very loosely. A panel of judges will select a winner and the guests who attend the open house on May 1 will vote for a “People’s Choice.” The winners will receive bragging rights, a hearty pat on the back and a trophy made by our handy-dandy craftspeople. This is more about revealing the creative and generous nature of designers in a way that engages the community, and not so much a hyper-competitive competition. Architects and designers (of any discipline! ), this is your chance to show off your design talents while helping St. Louis in a very real way. How does it work? Get your team together and register at Eventbrite. The $50 fee covers your official Little Free Library charter number. Firms can submit multiple entries, but you must register for each library. Official rules — which are pretty short to not stunt your creativity — will be emailed to you upon registration. Design and build your library masterpiece! The cost of materials cannot exceed $100. While you’re shopping and building, make a list of materials and instructions for assembly. Drop off your library at our studio on Wednesday, April 29, 2015, and email your materials list and assembly instructions by April 30, 2015. On May 1, we’ll open our doors so everyone can see your brilliant handiwork! We will collect books as “admission” to the event to make sure the libraries will always be well-stocked, even after they leave our gallery. A panel of judges will name a winner, and guests will select a “People’s Choice.” The party will feature literary-themed food, drinks and tunes from DJ Mahf. The libraries will be on display the entire month of May. At the end of the month, the libraries will be turned over to the St. Louis Metropolitan Police Department. The officers will place the libraries throughout the city. 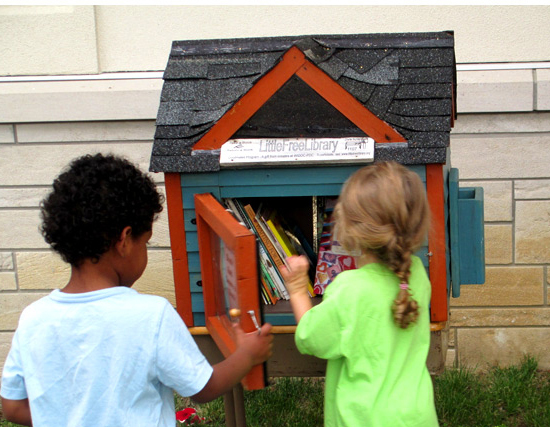 Your materials lists and assembly instructions will be given to the Little Free Library organization for distribution to bookworms who want to recreate your little library masterpiece. If you would like to make a donation or sponsor the event, please email Shelley at shelley [at] spacestl [dot] com. Even if you don’t have the means to design and build a library, make sure you come to the open house. The more the merrier! Oh the Places You’ll Go! Friday, May 1, 2015 5:00 to 8:00 PM, winners to be announced at 7:00 PM SPACE Architecture + Design 4168 Manchester Avenue St. Louis, MO 63110 Admission: a book! A downloadable pdf flyer is available here.